The CSS Virginia was built by the Confederacy during the American Civil war. It was constructed by cladding the half-burned former Union frigate Merrimac with layers of plate iron. 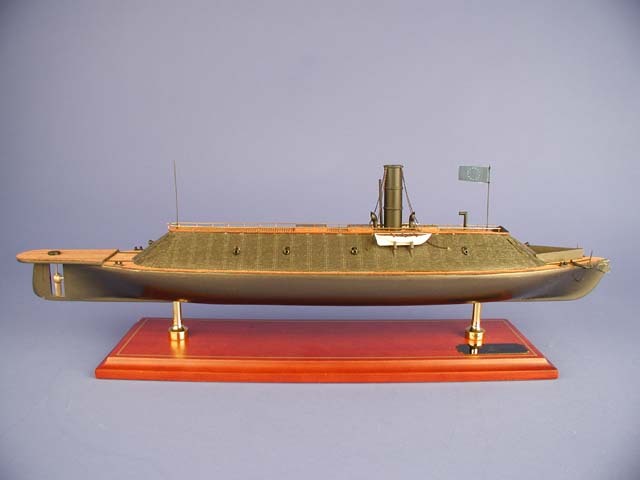 On its first day of action in 1862, the Virginia sank two unarmored Union warships, the Cumberland and the Congress, as well as caused a third, the Minnesota, to run aground. The following day the Virginia engaged the Union ironclad warship, the Monitor. The Monitor employed a turret which housed two eleven-inch guns, and was built to confront the threat posed by the Confederate ironclads. The two warships bombarded one another for about two hours with no clear victor being apparent. Neither ship fought again after that historic confrontation, and each sank at later dates. The clash of these two early ironclads changed the course of naval warfare and construction forever. Dimensions (L x W x H): 22.5" x 5.0" x 7.0"